The history of Swedish experimental film is a story of small broken histories. Sometimes it has resulted in significant works, such as Viking Eggeling's seminal Symphonie diagonale, or in significant experimental filmmakers, such as Gunvor Nelson. But, that is rather the exception than the rule. However, what unites Eggling, Nelson and the films that will be presented in this program is the international context as a prerequisite for the work and the individual films. Pontus Hultén and Hans Nordenström dwelled in Paris in the 1950s. Hultén was an art student at the time whereas Nordenström studied architecture. Hultén would become the leading force behind the Museum of Contemporary Art in Stockholm, Moderna Museet (MM), and is most well known for his work as a curator at MM in the 1960s and the first director of Centre Georges Pompidou. Hultén was foremost a curator and producer, it was mostly Nordenström who shot the films they made together. In Paris Hultén became a friend of Robert Breer and Jean Tinguely, and formed a hub for young Swedish artists. In Paris the Swedes spent time at the cinematheque and learned from the cutting-edge art scene that acclaimed kinetics to be the avant-garde of the avant-garde. Because of these connections and contexts a handful of films were made, out of which some of the most significant and original ones are included in this program. Many of them were screened when MM was inaugurated in 1959 with an avant-garde film festival in honour of Eggeling that was called Apropos Eggeling. A Miracle (1953), made by Breer and Hultén, is an anarchistic gem that shows why Hultén and his friends were so fascinated by animation. Everything is possible because film is a marvellous machine, and apparatus for metamorphosis and invention. The juggling Pope throws in his head and transforms into an angel who leaves the earthly life. En dag i staden (A Day in the City, 1956) is the most well known film of Hultén & co. Hultén and Nordenström made it together with their architect friend, Gösta Winberg, while artists and colleagues such as P.O. Ultvedt and Jean Tinguely were acting. The film is a joyful Dadaist attack against Stockholm and its institutions. The Royal Castle and National Museum is set on fire, all in a mix of different techniques of film editing. Animation is blended with live action and a rudimentary story line established in the form of the chase - a tribute to early film comedy. With Försvinnaren (The Disappearing Man, 1957) Carl Fredrik Reuterswärd, who had arrived in Paris as teenager and student of Fernand Léger, made a rare early conceptual animation. We follow a black character that is trapped by the frame of the screen, but after a short intermission manages to escape and is followed by illegible credits. With Nära ögat (Close to the Eye, 1958), P. O. Ultvedt uses animation according to his own preferences. Ultvedt sends out geometrical shapes and figures on an adventure with a stereophonic soundtrack that was partly recorded at his family's kitchen table. 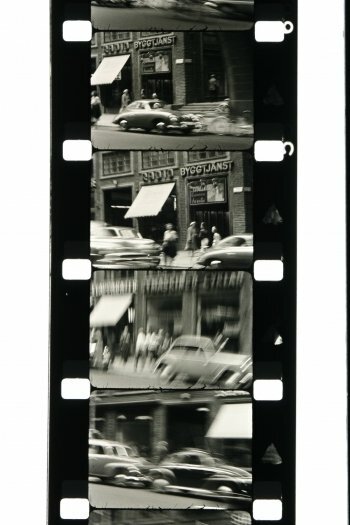 The last film in the series of 1950s work born out of the cinephilic culture of Paris and the aesthetics of kinetics, is Nordenströms unfinished film on Stockholm. Apparently the film was finished, but never shown in public. It is partly a home movie, a tribute to his and Hulténs friendship, and a depiction of that Stockholm that Nordenström loved as much as he hated. But, foremost the film is a sincere exploration of the means of cinematic aesthetics. The 1960s brought the American avant-garde film to Sweden and several screenings were arranged at MM in Stockholm. These made a huge impression on aspiring filmmakers, or artists in general who never thought that film could expand into being a personal visionary medium. Claes Söderquist and Carl Henrik Svenstedt are two filmmakers who have witnessed how important the American films were for them. Another seminal filmmaker who had the same experience, but who sat in the front row in San Francisco Bay Area, was Gunvor Nelson, then married to Robert Nelson. Both Söderquist and Svenstedt approached the Nelsons and Söderquist visited their home in Muir Beach. Svenstedt would, inspired by the Americans, inaugurate Sweden's first co-op, FilmCentrum, while Söderquist became an important curator and driving force behind Filmform, the national distributor and archive of Swedish artist's film and video. The films from the 60s are all shot in the U.S. Kirsa Nicholina (1969) is a straightforward documentation of a home birth. It is rarely screened but a highly interesting work because of its position as a nodal point merging political utopia with the expressive force of the American avant-garde cinema at the time, but also bearing witness to Nelson's skills and unobtrusive attitude. Svenstedt's Soundtrack (1968) is a depiction of the same U.S., but focusing on the clash between radical utopia and consumer capitalism. Söderquist's Travelogue (1969) is a depiction of a handful of contemporary American artists, from New York to San Francisco, ranging from Alfred Leslie to Robert Nelson who all appears in the film. You can see how both Svenstedt and Söderquist observes similar things whereas Söderquist is interested in the landscape and the imagery and Svenstedt in the clashes between images and expressionist aesthetics. Between these two depictions of modern America appears Nelson's acclaimed My Name is Oona (1969). The male gaze of Svenstedt and Söderquist being complemented with a sensibility that does not shun to blend control with freedom, beauty with fear, hope with anxiety, in a remarkable depiction of a child's universe in which all these parallel worlds are present in the same moment. The rhythmical repetition of "Oona" extends from the joy of discovering the musical aspects of everyday language, to threat and execution of power.